I am impressed when an author catches my attention on a topic I had no apparent interest in. 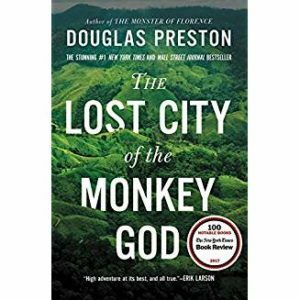 Douglas Preston does this in The Lost City of the Monkey God. This is the story of the first modern exploration of Ciudad Blanca – the White City – deep in the jungle of Honduras. No humans had been to this site in memory or recorded history. But there was reason to believe the site existed. Preston was a part of the expedition, as the resident author. I learned the history of the exploration and colorful details of the challenges and discoveries the team made, when they did in fact uncover the Lost City of the Monkey God. And then, half-way through, the story-line changes. After the team members return to their regular lives, an entire new catastrophe occurs, and we are drawn in to the health and medical implications of the team members who spent time in this extremely remote jungle, surrounded by unfamiliar insects and larger animals. Preston has written six other nonfiction books, five novels, and 24 books with Lee Child (of Jack Reacher fame). I would definitely read another Douglas Preston if I could figure out which one to read next! (Do any of you have a suggestion?) and am pleased to have read this one. Thanks, Jan, for this fine recommendation for book club! This sounds like one I’d like. Have added to my list. This book caught me off guard. Deschutes Public Library had the book, and after reading some noteworthy reviews I picked it up, intending only to give it my “50 Page Test”, as in, if I don’t like it in 50 pages I’m DONE with it. Twenty pages in, I was hooked, and ended up loving the book as much as Andrea did. I love books that introduce me to new realms, and this book did that twofold: once by describing the ruins an enormous Central American civilization that I knew nothing about, and second by a fascinating dive into a bizarre tropical disease that multiple expedition members (and possibly an entire ancient civilization) had to deal with. Well done, Douglas Preston!